Juvéderm Ultra XC injectable filler adds temporary fullness to the lips, while Juvéderm Volbella XC adds subtle volume and softens vertical lip lines. Fat transfer is another quick and efficient way to plump up lips and give them a full and beautiful result. The potential to use your own fat is a nice option for those who want to lose some fat in the tummy or hip area and “transplant” the fat to the lips. Some patients find that as they age, the length of the skin above the upper lip lengthens and covers up the bottom edge of the front teeth. With a lip lift, Dr. Virden removes the strip of excess skin from underneath the nose to rejuvenate the area around the mouth and lips. Dr. Virden's primary Lip Augmentation method is Silikon 1000. This off label medical-grade silicone is used for long lasting results due to it's inability to be broken down by the body. 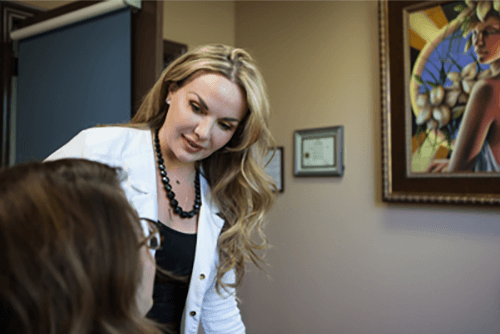 Depending on the augmentation option the patient chooses, surgery may or may not be needed, but all of the options can be performed as an outpatient procedure. Injections grafted fat o medical-grade dermal fillers do not need incisions and will be implemented with a syringe. It may take several injections to get the desired fullness. Patients can expect the lips to be tender and sore for several days after the surgery. Scarring is very minimal with a lip lift. Aftercare instructions will be given to help all patients properly care for their lips. Patients should see immediate results after their lip augmentation with injectable fillers or a lip lift. Dermal filler injections will slowly absorb into the body and thus the lips will naturally become smaller. Repeated treatments will be needed to maintain results.